Paradise Found But Where To Go? : Once you descend from Khardung La, you’re ready to experience the mystery and magic of Nubra. 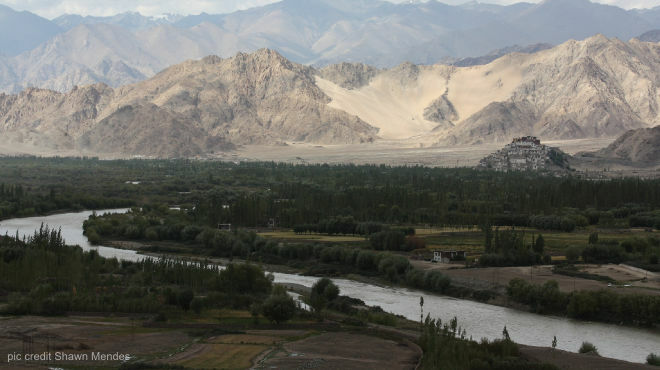 The confluence of the Nubra and Shyok rivers lies straight ahead and forms a ‘Y’ shaped valley. Each arm of the ‘Y’, is a separate circuit, which means you have a choice of two separate circuits. We recommend you do both. Along the Shyok River (the left arm of the ‘Y’), you can visit Diskit, Hunder and Turtuk. Along the Nubra (the right arm of the ‘Y’), you can visit Sumur, Kyagar, Tirith and Panamik. Each circuit has villages and settlements tucked into a gorgeous landscape, and have very different experiences to offer. Remember, travelling along mountain roads and dirt tracks takes much longer than in the plains, and it could take the better part of an hour to cover only a few kilometers. So account for this when planning your itinerary.